Woodwork By Stan All our furniture is made by hand, one at a time, using only the finest materials. All our furniture is made by hand, one at a time, using only the finest materials. I have been working wood seriously for more than 40 years, but I got my first splinter creating a shoeshine box in my Dad's basement workshop in Milwaukee, Wis. Now I have my own workshop in Elk River, Minn. -- and I hope I'm making Dad proud. I take great pride in crafting beautiful, comfortable and durable furniture. I don't have any employees or a factory. I work out of my own home shop. Every piece of furniture you see is hand crafted by me, one at a time. Most of the items I make are on a build-to-order basis. If you don't see something that suits you, feel free to contact me -- 763-241-9643 or stan@woodworkbystan.com -- and I'll work with you to create something you'll be proud to own. I look forward to supplying you with quality furniture that you will enjoy for years while entertaining family and friends or just relaxing in your backyard, patio, deck, gazebo or sunroom. Visit our What's New in Stan's Shop page often to view new designs and new products. If you have any questions or suggestions, feel free to call or e-mail. 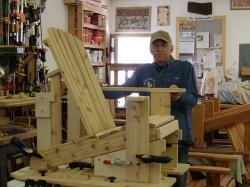 Stan Schmidt Stan building an Adirondack chair. let us know, and we will make it right.